This supply chain management course clearly explains what supply chain management is and how it can be essential for a company's success. By taking this course, you will learn about how a supply chain management system encompasses the flow of goods and services leading to the end user. You will be shown how to achieve excellence in supply chain management, which will make you a valuable asset for any business competing in a global environment. This supply chain management course will first introduce you to the subject of supply chain networks and supply chain operations. You will then learn how a supply chain is used to represent all the individual firms, personnel, and physical infrastructure required to create products and transport them to customers. You will also gain a strong understanding of the topic of integrated supply chain networks, and will learn the best practices applied in modern supply chain management. Next, you will learn how each interconnected member in a supply chain can best move materials, information, or money in response to customers' demands. This will bring you to the topic of supply chain networks. What is a supply chain network? 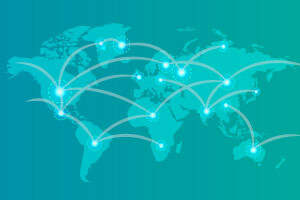 Supply chain networks allow a manager to look at the big picture and gain a holistic understanding of national and international flows of materials and information. This is a very important tool, especially for logistics and business managers. The course will cover it in detail. The Introduction To Supply Chain Management course will be of great interest to all professionals who work in the areas of operations management, logistics, procurement, and information technology. It will also be useful to all learners who are interested in developing a career in the area of supply chain management. So why wait? Start learning how to analyse the essential supply chains relevant to your organization and provide the best value to your end-customers today. Explain what the terms supply chain and supply chain management mean. Describe what supply chain networks are. List examples of supply chains. Describe what is meant by integrated supply chain networks. Describe best practices in supply chain networks.